Bribery, looting, civil unrest; public meetings and unresponsive government officials; tangled lines of communication, competing stories: these things are the stuff of many a contemporary political struggle, but they are hardly unique to the modern world, or any period, probably. As the story below reveals, these ‘key words’ could be quite apt in describing provincial Ottoman power struggles and governance. This particular story, of a ‘unjust’ Ottoman governor of Syria and the repercussions of his apparent ‘crossing the line’ in and around Damascus, comes from the ‘notebook’ of Ismā’il al-Maḥāsinī, briefly described in the post preceding this one. As a member of the ‘ulama, the body of learned, elite men who constituted one of the key political and economic power groupings of the Damascene body politic, Ismā’il was not a disinterested observer, unsurprisingly. In this story the ‘ulama are seen uniting around the qadi, the Ottoman-appointed judge (and one of the most respected and powerful, though by no means unchallengeable, public figures in any Ottoman city); alongside the ‘resident’ military class (here probably one of the two groupings of janissaries stationed in Damascus) they support the qadi in his attempt to bring the rapacious governor and his lieutenant to bay. Yet there are other political groupings as well- significantly, the heads of the craft guilds, presumably supported by the larger body of craftsmen, rally against the governor, going so far as to participate in (and perhaps initiate) a general strike across Damascus, shutting down their shops and joining in the chorus of discontent with the governor. In other words, it was not just the ‘ayān, the so-called ‘urban notables,’ who participated in politics. Others could have a voice (indeed, the irregular soldiery should also be seen as political participants). Things proceed from the strike and ‘public meeting,’ growing more complicated as the governor’s faction- which in this story seems to consist solely of a few lackeys and a mob of irregular soldiery- tries to ‘control the narrative’ at the seat of imperial power in Edirne and Constantinople, against efforts by the qadi and others to do the same. In Ismā’il’s somewhat breathless and sometimes hard to follow account things eventually work out: justice is eventually had through the intervention of the imperial center, or so it would seem from the somewhat abbreviated conclusions (this is, after all, someone’s personal diary, albeit probably with a semi-public intention). In read it, we should keep in mind that it represents one particular perspective- the governor would no doubt have had a different view of things, as would his followers, such as they may have been (and he may indeed have been isolated- a crucial factor in his downfall). In my translation I have tried to retain as much of the tone of the original as possible. I ran up against some difficulties, noted in brackets, due to my limited knowledge of colloquial Syrian in the period; there are also what appear to be either errors in the original text or in the editing of the printed text. Words of Turkish origin I have presented in their Turkish rendering for clarity. 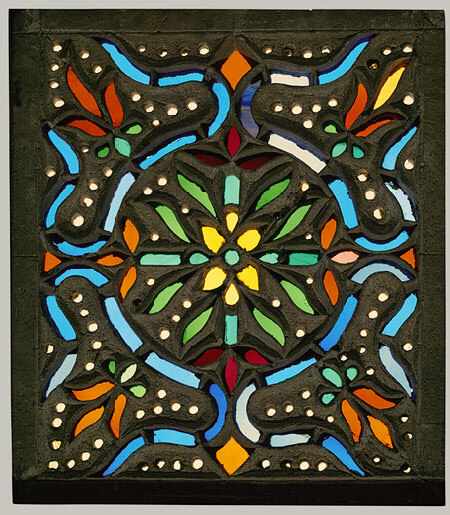 Stained-glass window, 17th century [Egypt or Syria]. (93.26.3,4) In Heilbrunn Timeline of Art History. New York: The Metropolitan Museum of Art. Praise be to God. When Ḥusayn Pasha Yek Shasham was Pasha [governor] of Syria [al-Shām—here also simply Damascus] in the middle of the year 1085 , he had a katkhudā [steward] named Ḥasan Agha who had previously been kutkhudā for Ibn ‘Abd al-Raḥīm Efendi, previously Shaykh al-Islām. Ḥusayn was ordered to accompany the pilgrimage, [but before leaving] and he carried out the utmost oppression upon the subjects (ra’īya) and the villages, and he took from the heads of the craft-guilds (arbāb al-ḥiraf) many things which would have been worth a great deal had they been sold on the market, and he left Syria and did not pay anyone anything. He left in his place the aforementioned Ḥasan Agha. He undertook oppression, transgressions, the reception of bribes and refused to listen to the command of the Qāḍī Shahlā ‘Abd al-Bāqī Efendi. And he had in his service a man whom the pasha used to send as a mutasalim [a deputy of the governor, and often a tax-collector], named Aḥmad Agha. The aforementioned Ḥasan sent him to around five or six households [? jihāz] in the eyalet [province] of al-Shām, and he killed unjustly, plundered, and the community was ashamed, he not fearing God at all. When the pasha returned, this Ḥasan kept on with what he had been doing, and the pasha likewise, as he no longer listened to the qadi’s commands and prohibitions. And things become dire for the Muslims to the extent that the pasha had saricas and sekbans [locally-raised irregular cavalry and infantry] who would interfere with the property of the people of al-Shām and the villages, and with their very lives, obliterating public safety. Then they went so far as to begin meddling with the sacrosanct households of the Muslims—and the people could not tolerate that. So, on Friday, Rabī’ al-Ākhir 4, 1086 [June 28, 1675], the people of the city gathered together, shut down their shops, and came to the qadi in order to complain about their condition. The ‘ulama and the soldiers (al-‘askar) also gathered together in the place of the court, and the qadi sent a contingent drawn from the ‘ulama and the soldiers to the pasha, who reported on behalf of the people the injustice against the people and the injustice of Ḥasan and [called for] his dismissal. But nothing came of their visit to quench the burning thirst of the Muslims [i.e. no remedy to the oppression was forthcoming]. So they sought from the qadi, and the ‘ulama and soldiers who were present, a petition to the exalted Sultan with all the relevant information contained therein. So the qadi, with the ‘ulama and soldiers, wrote the petition and handed it over to Muḥammad Agha ibn ‘Abdī Agha, previously a regimental commander, for him to take it to the Threshold of the sublime Sultan— God grant him victory! So he took the two of them [sic—two separate petitions?] and went out from al-Shām covertly, at night, on the night of Monday, Rabī’ II 7, 1086 [July 1, 1675]—may God make the Muslims heard through him so as to gladden them, and repel from us and from them what afflicts us and them, amen. Then the pasha sent the aforementioned Katkhudā Ḥasan to the Sultan also in order to defend himself—may God rather defend those who believe! Ḥasan Agha went via postal-horse and overtook Muḥammad Agha in reaching the place of the exalted Sultanic abode, Edirne, by many days. And by embellishing his speech he gave off impressions in order to derive benefit. He sent out a report the pasha. He went out with it on al-Jumādī I 7. He came to Istanbul and it just so happened through the divine decree that He beheld the matter of the judgment of al-Shām. And he came to Mīrzā Muḥammad Efendi, and he took the report and went with it to al-Shām, reaching the city at noon on Saturday, Jumādī II 9. And Mīrzā Muḥammad Efendi sent a letter to Aḥmad Efendi Bakrīzāde delegating him for duty, so he sat for judgment in a courtyard in the place of the court, and on Sunday in the Nūriyye. On this day the pasha summoned the aforementioned qadi ‘Abd al-Baqi and all of the ‘ulama to the Ṣālihiya, [then] to the palace of Ḥusayn Efendi ibn Qarnaq, and he showered the qadi and the rest with great hospitality and kindness. After the hospitable reception was over, he sent the qadi a horse as a gift. As for Muḥammad Agha, report came from him to al-Shām that that he entered Edirne on Jumādiī I 12, and the cause of his delayed coming was that he went to Edirne from al-Shām upon a different route from Ḥasan Agha, and that he was riding his own mount, not upon a postal-horse. And ‘Abd al-Bāqī travelled from al-Shām on Monday, Rajab 2, 1086. And on the night of that Tuesday an agha, named Ḥasan Agha, a qapuju [warden-officer] of the Sublime Porte, entered al-Shām, in order to adjudicate regarding the truth of what the qadi and the people of al-Shām reported, and the truth of the words of Ḥasan Agha and his pasha. Then our lord Mīrzā Muḥammad Efendi entered al-Shām on Monday, Rajab 16 of the aforementioned year [October 6, 1675]. On the second day [after his arrival] the notables (‘ayān) of the land from among the ‘ulama and soldiers gathered together in the place of the court, and the Qapuju Ḥasan Agha came and read the sultanic order which he had brought, and its gist was that the petition of the Qadi of al-Shām and of the people present with him had risen to the Sublime Porte, and his complaint had arrived, they mentioning that Ḥusayn Agha took many things from them. ‘So We sent Ḥasan Agha so that for everyone from whom something had been unjustly taken he might restore what had been taken from him, after establishing the matter in accordance with the Shari’a, in the presence of the qadi.’ He specified that the qadi would listen to the claim, and specified that the commanding and the realization of the supplication be the affair of the Sultan—God grant him victory! And the people came out, as everyone who had a complaint came to the place of the exalted Shari’a. Then Ḥusayn Agha assigned Kutkhudā Ḥasan Agha to listen to the complaints of the supplicants from among the assembly. And they laid charge [upon him and the pasha] with some eight of the specific points written out in the petition of the qadi and the people. So Ḥasan Agha [the qapuju] acknowledged that and the qadi wrote his report and put in six items of authorized evidence, and the veracity of the petition of ‘Abd al-Bāqī and the people of the land present was made manifest. The qapuju sent the authorized evidence along with the written report of the qadi to the Sublime Porte on Ramaḍān 2, 1086; he himself left al-Shām on Ramaḍān 27. Then on the second of Shuwwal [December 12, 1675] Ḥusayn Agha turned away from al-Shām, in the company of our lord Vezier Ibrahīm Pasha, who had previously governed al-Shām distant from Ikrīd [this last line’s meaning is unclear to me]. Ismā’il Maḥāsinī, Kunnāsh Ismā’il Maḥāsinī, ed. Ṣalāḥ al-Dīn Munjad (Beirut: Dār al-Kitāb al-Jadīd, 1965), 111-113.